I'm SO excited to share these products from Contrary Polishes for February PPU. They've created a beautiful nail polish as well as a tinted lip balm that I've fallen in love with! Keep reading for lots of photos and reviews of both products. All photos in this post are taken under artificial light. All polish swatches are topped with Glisten & Glow HK Girl topcoat. These products were provided for my honest review. I've never seen these particular gummies before, but I can confirm that they are just as delicious as they are adorable. 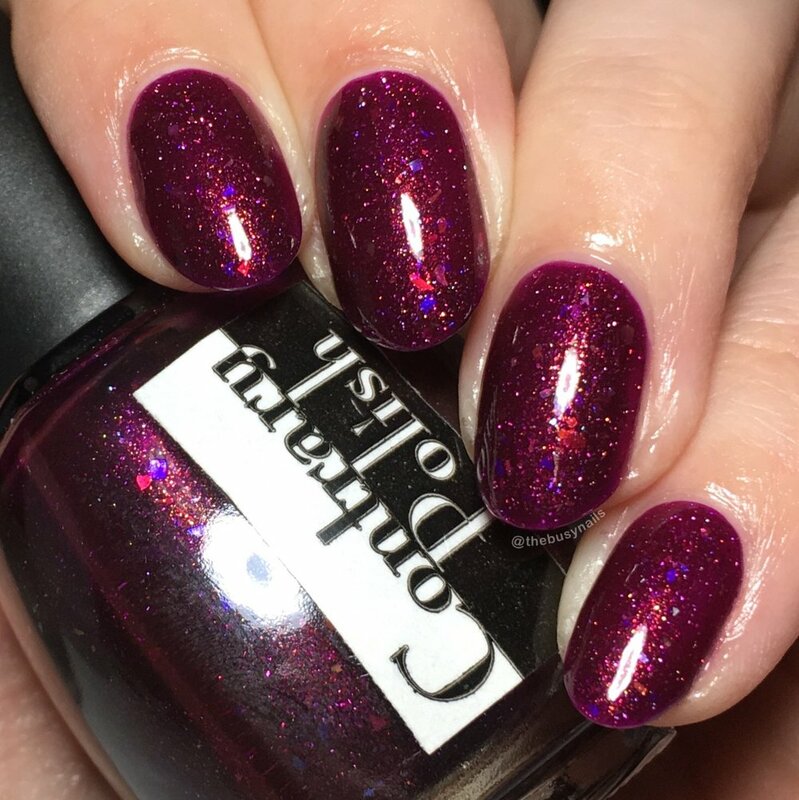 A note from the maker: I took inspiration primarily from the purple and yellow couple, but added holo microflakes and multi-colored iridescent flakies to the polish as a nod to the other couples. Maker Description: a deep red-toned purple filled with gold microflakes, holo microflakes, and a rainbow of iridescent flakies. As a special treat, each purchase of this polish will also receive a tiny baggie with one gummy bear “couple" in it. Formula: I found this just slightly sticky to work with, but that didn't stop me from getting an excellent, clean mani out of it. 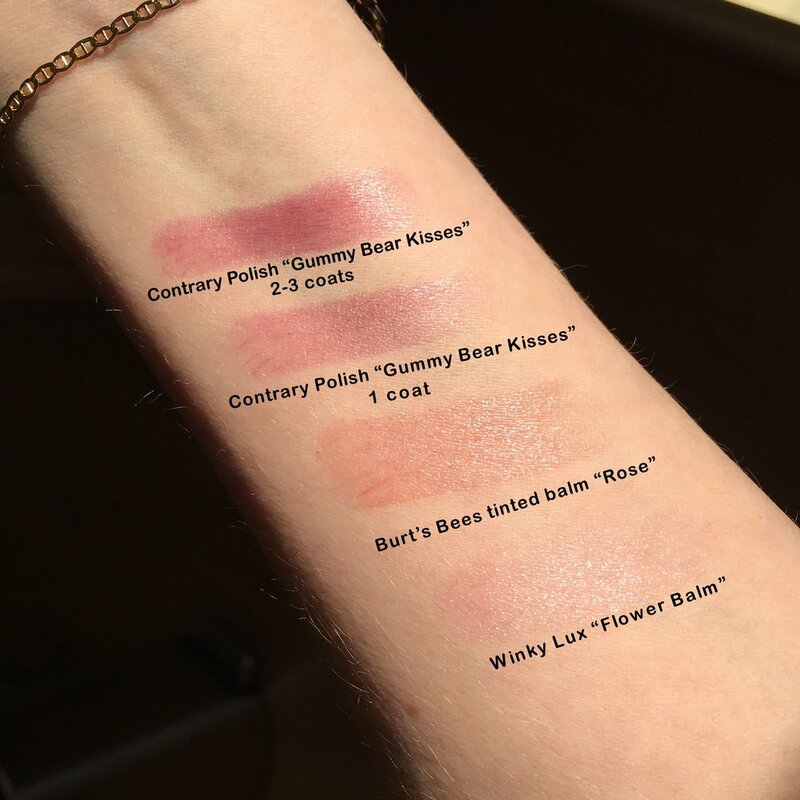 My Thoughts: I'm a big fan of this shade! I wore it as a full mani for several days. I tend to like these deeper wine/purple shades and the added flakes and juicy base make this really beautiful. Removal: Easy peasy, no issues. 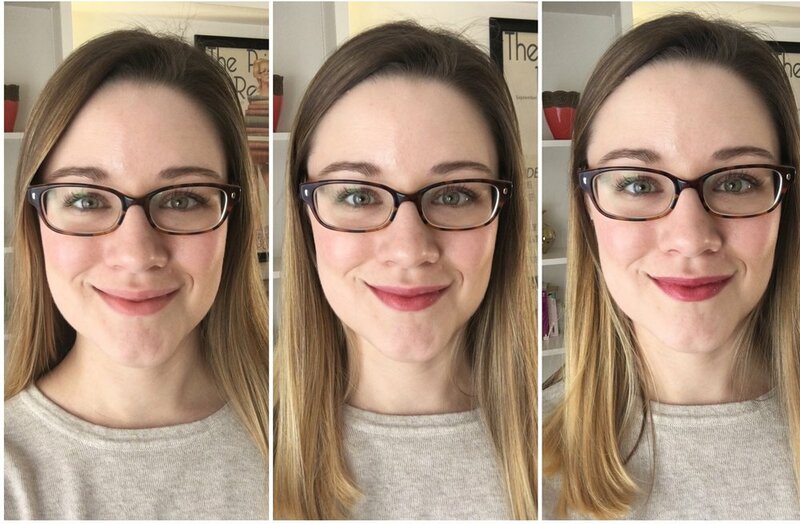 I'm a big fan of tinted lip balms, having 2-3 in my bag at all times, so I was really excited when Contrary asked me to review this one. I'm happy to report that I LOVE IT! I love the smooth formula, and most of all, how buildable the color is. A simple swipe gives you just a hint of color, but building up 2-3 coats really deepens it. It's very customizable based on your preference. Keep scrolling to see it in action. 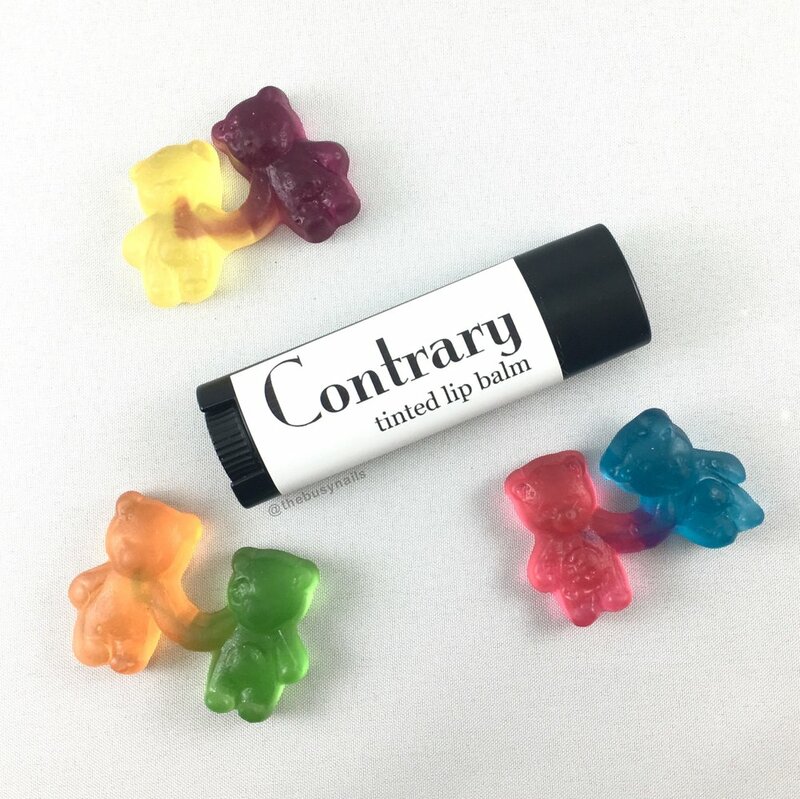 Maker Description: a gummy bear-scented tinted lip balm (0.15 oz). It is a red-toned purple like the polish, but simply provides a sheer wash of color on the lips. Formula/application: Smooth, creamy and very buildable. Not too waxy and feels nice and moisturizing on the lips. My only complaint is the container: for tinted balms, I prefer a basic round container instead of the oblong one, but that's not deal breaker by any means. Scent: The scent to me smells more like a cherry Twizzler than gummy bears, but either way it's a light, sweet scent. Gummy Bear Kisses compared to two other tinted lip balms. 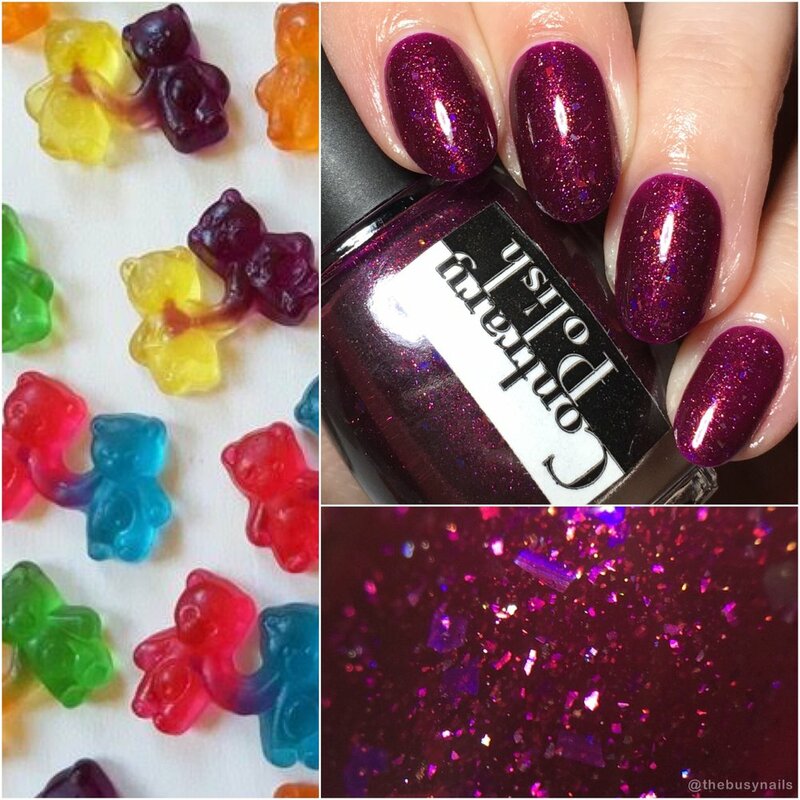 You can purchase Contrary Polish "Gummy Bears in Love" polish for $12 and "Gummy Bear Kisses" tinted lip balm for $6 on the Polish Pickup website Feb. 2nd at 11 AM EST thru Feb. 5th at midnight EST. Need to stock up on supplies? Consider Amazon.